MELBOURNE, Australia — Australia’s Defence Capability Acquisition and Sustainment Group issued a request for information for at least 16 special operations support helicopters. The helicopters will be acquired under Project Land 2097 Phase 4, which has not been formally approved by the Australian government but has been identified as a priority for future defense spending in the 2016 Defence White Paper. The proposed timeline calls for a request for tender in the fourth quarter of 2019, with the major delivery of equipment to follow in 2022. “The project is currently in the exploratory phase, collecting information and proposals to inform concepts for capability realisation,” according to the RFI’s cover letter, authored by CASG’s acting first assistant secretary of the helicopter division, Brigadier Jeremy King, and the head of land capability at Army Headquarters, Maj. Gen. Kath Toohey. “The project is considering a wide range of procurement options based around a light helicopter as the major system. The acquisition strategy is developmental and is subject to Government approval,” the letter read. According to the RFI, the requirement is for a proven commercial or military off-the-shelf light helicopter, which is already in service with other operators. Other requirements include optimization for use in dense urban environments, capable of rapid deployment by the Royal Australian Air Force’s C-17A airlifters, and the ability to be fitted with simple and proven intelligence, surveillance and reconnaissance equipment and weapons. 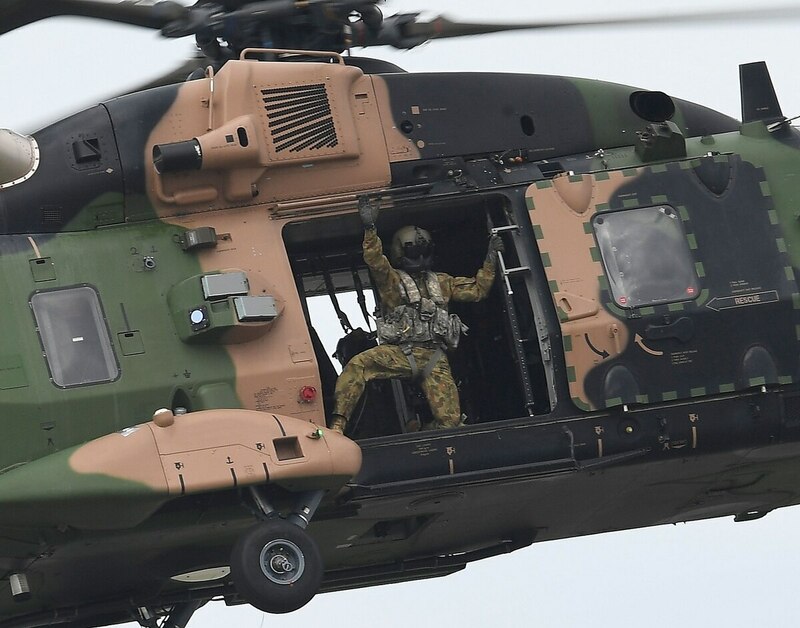 The helicopters are intended for use by the Australian Army’s 6th Aviation Regiment, based at Holsworthy, south of Sydney, and will complement a squadron of larger NHI MRH-90 Taipan helicopters. The Taipans are replacing the 6th Aviation Regiment’s existing Sikorsky S-70A-9 Black Hawk, beginning in January 2019. The RFI does not specify a desired size for the new helicopter, but four are required to be deployed aboard one C-17A. In an earlier update to the Army’s major battlefield aviation programs, CASG’s first assistant secretary of the helicopter systems division, Shane Fairweather, and Toohey discussed a helicopter in the four-ton class. The primary role of the new helicopter will be to provide an air assault capability by small teams of special forces, with secondary roles including ISR (using electro-optical sensors), fire support and general utility. The RFI calls for a helicopter that can be rapidly reconfigured between these roles. The main base for operations will be at Holsworthy, but the Australian Army is considering the establishment of a permanent detachment of helicopters — referred to in the RFI as the “independent detachment” — in a yet-to-be-decided location. Australia’s Special Operations Command has two commando regiments based at Holsworthy and the Special Air Service Regiment based in Western Australia. The RFI calls for four helicopters to be maintained online at Holsworthy, in addition to the independent detachment (four aircraft) and two deployable elements, each of four helicopters. The number of helicopters to be acquired is not specified in the document, but respondents are asked to provide an assessment of how many will be needed to support 16 aircraft online at any given time. The forthcoming RFI was a major focus at the 2018 Land Forces exhibition, held in Adelaide in early September, with several major helicopter manufacturers declaring their intention to respond. Then-head of Airbus Group Australia Pacific Tony Fraser said the European manufacturer intends to offer its 3- to 7-ton H145M helicopter. “We will compete the H145M and we expect it to be a very strong competitor,” he said. Also speaking at Land Forces, Bell’s business development director for Australia, Dan McQuestin, revealed that the company intends to bid the 2.5-ton Bell 407GT, an armed version of the popular 407GX civil helicopter. “It’s COTS, it’s already deployed in the field in the Middle East and maintained through a commercial supply chain,” he said. Boeing Defence & Security’s vice president of global sales and marketing for Australia said he was keen to see what the Commonwealth’s requirements would be, but the U.S. manufacturer saw its 1.6-ton AH-6i Little Bird as a candidate. Leonardo’s helicopter division announced during the show that it will propose the AW109 Trekker helicopter. Other potential contenders include MD Helicopters with its MD530G helicopter, and Northstar Aviation with the 407MRH Lightning, a multirole helo based on the Bell 407.